Free public Wi-Fi in the Golden Triangle neighborhood is available along Pennsylvania Avenue NW, in and around Farragut Square, and in Edward R. Murrow Park, allowing people in this tech-savvy neighborhood to bring their work outdoors. 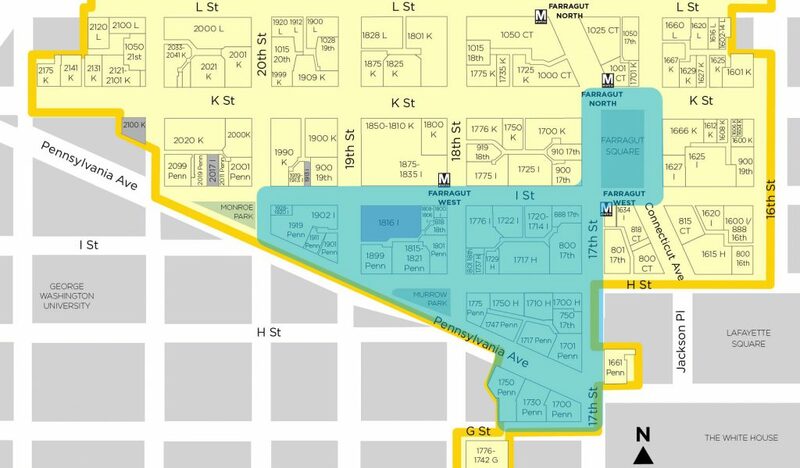 As part of the PA 2040 Smart City initiative, the city installed public Wi-Fi access points on several blocks of Pennsylvania Avenue west of the White House, H Street, and I Street, as well as in Farragut Square. (See blue area on map.) In addition to providing free Wi-Fi, this Internet access also connects smart city sensors measuring air quality, traffic safety, and congestion and enables smart LED lighting. The Golden Triangle BID will explore uses of data generated by these sensors to improve operations and programming. This first-generation installation of sensors is another step toward a transformed Pennsylvania Avenue. Read more about our vision for Penn West. 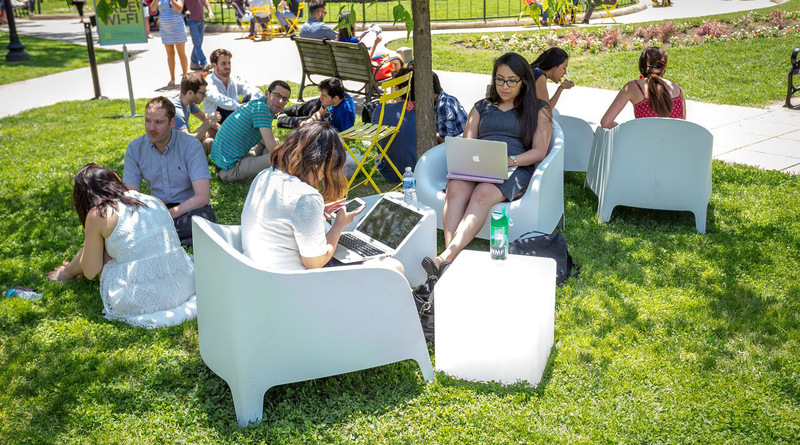 During Farragut Fridays in the summertime, the Golden Triangle BID hosts Outdoor Office, where workers and visitors are encouraged to use comfortable chairs and Wi-Fi to get out of the office. One of the most popular uses of this space is for outdoor meetings throughout the day. The national park at Pennsylvania Avenue and 18th Street welcomes workers and visitors outside to work and play. Throughout the summer, the Golden Triangle BID’s Picnic in the Park on Wednesdays also includes games, extra seating, and giveaways.